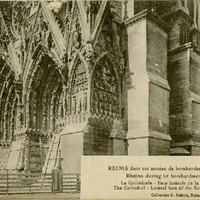 A postcard depicting the lateral face of the south tower of Cathédrale Notre-Dame de Reims, or Our Lady of Reims, during the years in which it was bombarded by the German Army in World War I. Originally the site of the coronation of the French kings, photographs of the destruction of cathedral were used as propaganda images by the French against the Germans. Wooden scaffolding on the north side of the cathedral caught fire during the bombing, contributing to the extent of the damage. This photograph of the southern side shows the attempts to guard the cathedral against damage. A., Nancy. “Reims During 1st Bombardment Years Postcard.” RICHES of Central Florida accessed April 19, 2019, https://richesmi.cah.ucf.edu/omeka/items/show/6619.